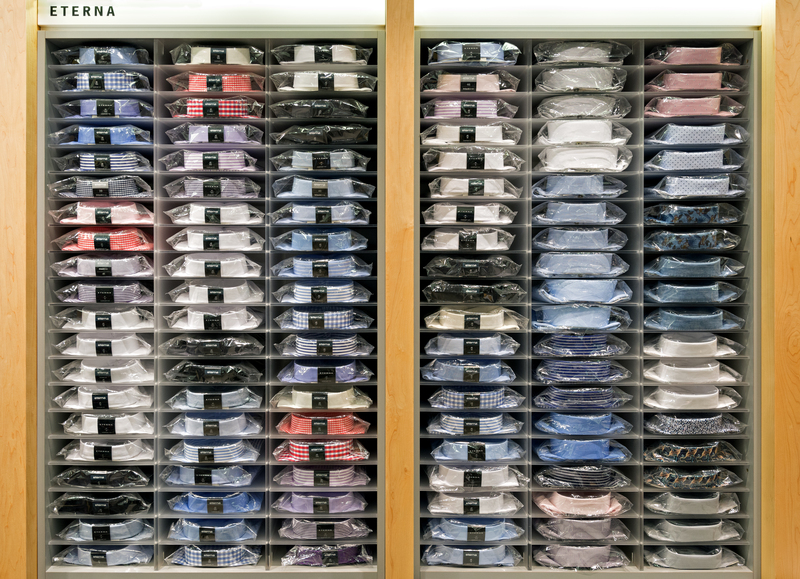 Non-iron Eterna is part of our wide range of shirt collections at Robert Smart Menswear in York. We guarantee “this is the easiest shirt that you’ve ever laundered”. No other shirt stays as crisp or feels as fresh as an Eterna from Robert Smart in York! ETERNA NON-IRON EXCELLENT Shirts: The two fold poplin that is used for Eterna shirts is woven in Switzerland from extra long staple cotton which results in the finest shirts which are Non-Iron lightweight, smooth, and durable and remain crisp looking all day. Classic, semi spread and button down collar shirts. Single, duo and double cuff. Regular long sleeve, extra long and half sleeve. Regular or slim fitting. Remember, ALL Eerna shirts are made from 100% Swiss Cotton and have a 2 year unconditional guarantee. Come and view the Eterna shirt collection at Robert Smart Menswear on Low Petergate in York.